Do you love a good love story? I enjoy reading about plants, landscaping, history, my sports teams and theology but there’s something about love that touches something deep inside of me. Ruth is love story. Ruth was single and financially destitute, but she was faithful, determined and trusted God. While she waited for her situation to change she kept her hope alive. Ruth’s story begins with death but ends with marriage and a baby. Yes it’s a romantic story but, behind the scenes is the faithful love of God who romances every hopeful heart. In review: Chapter 1 opened with tragic circumstances. Naomi and her husband ran off to Moab to find food during a famine. They fell for the “Grass is Greener Myth.” The head of the family Elimilech and both his sons died in Moab. The boys left behind two young widows: Orpha stayed in Moab, and Ruth returned with Naomi to her land, people and to God. Naomi and Ruth returned to Bethlehem as poor beggars. But then, in chapter 2, suddenly, there arose the possibility of resolution in their circumstances. Ruth went out to glean in the barley fields and there met God’s good and righteous man, Boaz. 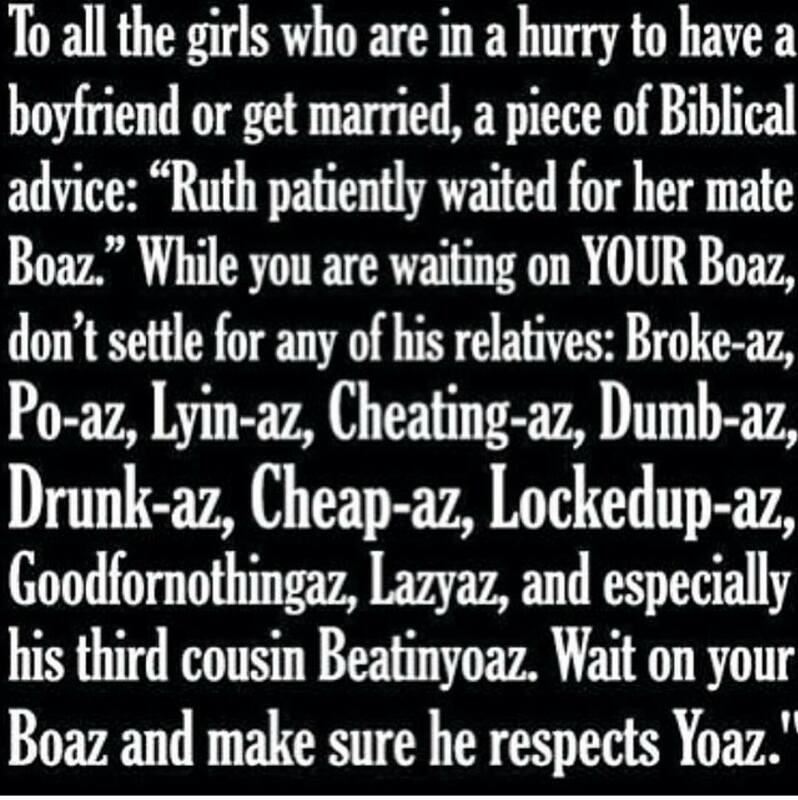 Boaz showers encouragement, opportunities, food, shelter, fellowship and blessings upon Ruth. Chapter 3 begins the love story which is a key component of this book. The love that begins between Ruth and Boaz reminds us of what the book is about. Ruth is a story of redemption. Redemption has to do with being rescued or delivered. Ever since Boaz came into Ruth’s life, Naomi has been a different person. Her concern is no longer for herself and her grief but for Ruth and her future. It’s when we serve others that we ourselves receive the greatest joy and satisfaction. When the two widows came to Bethlehem, their plan was that Ruth take care of Naomi and both of them eke out an existence the best they could. But now Naomi has a new plan: Ruth is to marry Boaz, and then all of them can live happily ever after. Naomi could tell from Ruth’s report that Boaz would be in favor of the plan, so she began to set things in motion. In that day, it was the parents who arranged marriages; so Naomi was not out of place in what she did. Keep in mind that the Book of Ruth is much more than the record of the marriage of a rejected alien to a respected Jew. It’s also the picture of Christ’s relationship to those who trust Him and belong to Him. In the steps that Ruth takes, recorded in this chapter, we see the steps God’s people must take if they want to enter into a deeper relationship with the Lord. Like Ruth, we must not be satisfied merely with living on leftovers (2:2), or even receiving gifts (2:14-16). We must want Him alone; for when we have Him, we also have all that He owns. It’s not the gifts that we seek, but the Giver. By the way, there was nothing immoral about this procedure that Naomi set for it was the only way Ruth could offer herself to Boaz in marriage in a way that was culturally right and that followed the customs and biblical laws that they lived by. She had to put herself at the feet of the lord of the harvest, and he would do the rest. Suppose that on her way to the threshing floor, Ruth decided to take a different approach. Why lie at the feet of the man you want to marry? Why uncover his feet and then ask him to put a corner of his mantle over you? Certainly there ought to be a better way! Had she used another approach, Boaz would have been confused; and the entire enterprise would have failed. The Old Testament priests knew how to approach God because He gave them their instructions in the law. New Testament Christians know how to approach God because in the Word He has told us what is required. Ruth followed these instructions and everything worked out perfectly. Put Ourselves at the Feet of Jesus. Four times in this chapter there is mention of feet (3:4, 7-8, 14). Ruth had fallen at the feet of Boaz in response to his gracious words (2:10), but now she was coming to his feet to propose marriage. She was asking him to obey the law of the kinsman redeemer and take her as his wife. What is a kinsman redeemer? A kinsman or family redeemer was a relative who volunteered to take responsibility for the extended family. When a woman’s husband died, the law (Deuteronomy 25:5-10) provided that she could marry a brother of her dead husband. But Naomi had no more sons. In such a case, the nearest relative to the deceased husband could become a family redeemer and marry the widow. The nearest relative did not have to marry the widow. If he chose not to, the next nearest relative could take his place. If no one chose to help the widow, she would probably live in poverty the rest of her life, because in Israelite culture the inheritance was passed on to the son or nearest male relative, not to the wife. We have a family redeemer in Jesus Christ, who though he was God, came to earth as a man in order to save us. By his death on the cross, he has redeemed us from sin and hopelessness and thereby purchased us to be his own possession I Peter 1:18-19. This guarantees our eternal inheritance. Ruth understood: This man Boaz is my kinsman-redeemer. I have a right to claim him. In fact, I must claim him as my kinsman-redeemer. I will go tonight and let him know. Like Ruth, I believe we need see our need for redemption and go to Christ. We need to see our need for something better in our lives and go to Christ. What needs redemption in your life? Is it only your soul or could it be your health, finances or relationships? For change, for true love, for redemption we need to put our all our lives at the feet of our redeemer. In the responses of Boaz to Ruth, we see how the Lord responds to us when we come to Him. Just as Boaz spoke to Ruth, so Christ speaks to us from His Word. He accepts us (Ruth 3:8-10). Boaz might have refused to have anything to do with Ruth; but in his love for her, he accepted her. He even called her “my daughter” and pronounced a blessing on her. Jesus accepts us just like this! He assures us (Ruth 3:11-13). In the midnight darkness, Ruth couldn’t see the face of Boaz, but she could hear his voice; and that voice spoke loving assurance to her: “Fear not!” Our assurance is not in our feelings or our circumstances but in His Word. Since Naomi and Ruth believed that Boaz would accomplish what he said he would do, they waited patiently until they received the good news that Ruth would be a bride. I confess that waiting is one of the most difficult things for me to do, whether it’s waiting in a line at the grocery store or waiting for God to answer a prayer. I like to see progress and I like to see things happening. Perhaps that’s why the Lord has often arranged for me to wait. Boaz was busy working for Ruth, and Naomi was confident that he wouldn’t rest until he had settled the matter. “Being confident of this, that he who began a good work in you will carry it on to completion until the day of Christ Jesus.” Phil. 1:6 It encourages my heart to know that Jesus Christ is working unceasingly in and for His people. I have put myself at the feet of Jesus my redeemer and I will trust Him to work on my behalf, will you? Sources: Life Application Study Bible, (Wheaton, IL: Tyndale, 1988), WORDsearch CROSS e-book, 401. Warren W. Wiersbe, The Bible Exposition Commentary – History, (Colorado Springs, CO: Victor, 2003), WORDsearch CROSS e-book, 191. This entry was posted in New Beginnings - Ruth and tagged Boaz, Jesus, kinsman redeemer, marriage, Naomi, patience, Ruth 3, true love, waiting. Bookmark the permalink.